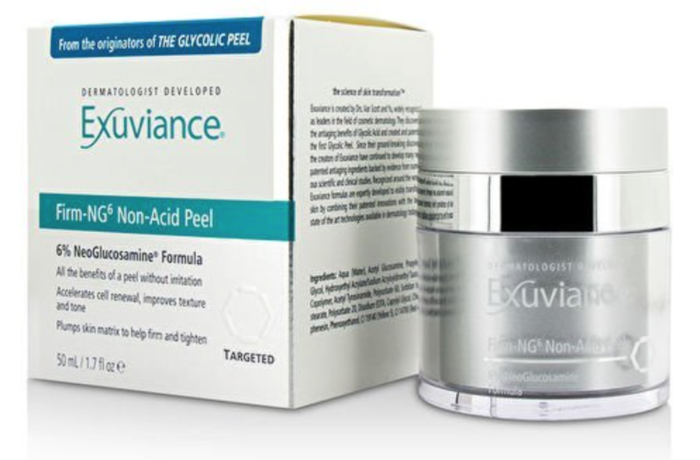 Exuviance Firm-NG6 Non-Acid Peel – a peel without the burn. It is a 6% patented NeoGlucosamine® formulation and the complain claims it provides all the benefits of a peel without irritation. It's a firming treatment that's formulated to accelerate cell renewal and plump the skin’s matrix to help firm and tighten skin. While firming, this non-acid peel exfoliates to even pigment and brighten skin, to improve texture and tone. I can't say it works as I have not tried it and these are the company claims. Company says it's perfect for all skin types. Treatment can be used by peel newbies and experts alike. Exuviance Firm-NG6 Non-Acid Peel retails for $68.